I am not a bird watcher. Nor am I a bird lover. Yet, birds are harbingers of pivotal turning points in my life. For years, I never connected the appearance of a bird with an event in my life. For example, there was the time I came home from college to visit my mom, and she looked at me in horror — I kept walking closer to her — and she kept backing away from me — her eyes getting bigger and bigger and bigger with every step. “A bat,” she was finally able to say, “is hovering over your head.” What happened in my life after that bat visitation? Something did, I’m sure of it now. I know that bats are not birds. They are clearly mammals protected by law. (Once, one visited me in the middle of the night while I was in the bathroom.) But bats, like birds, fly. For this story, bats will be birds. Now, it appears, I’d be a fool not to believe such connections exist. The appearance of a bird, or rather, the activity of a bird, always seems to appear before a major event. 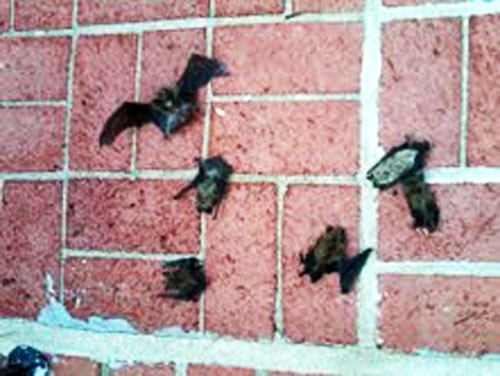 Thirteen bats showed up dead in our house the morning of July 12. A few hours later my son split his tibia and ankle joint. 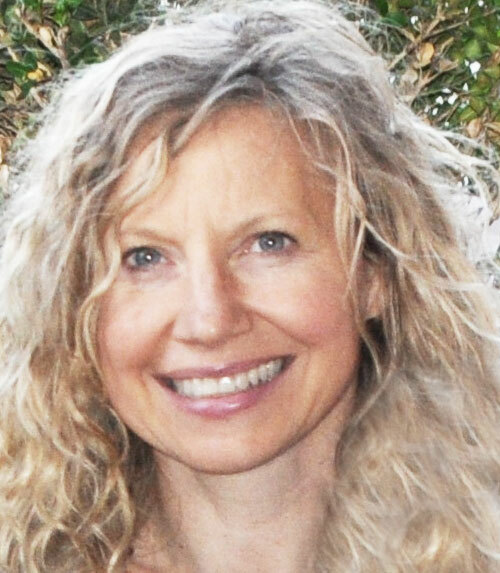 On a spring day, when birds were actively chirping and feeding their young, my brother and I sat outside of the hospital, waiting for the doctors to tell us that our mother was awake, and that she would be fine. A dead bird lay on the sidewalk in front of us. No matter how much we tried to avoid looking at the bird, we couldn’t help but notice — every person that walked by had to stop and walk around the carcass. The interruption of countless visitors’ strides during those 20 minutes were a constant reminder that death was imminent. And it was. The problem is, knowing that aviary activity is an omen, doesn’t necessary stop what’s going to happen. A part of me has always known that at some level. There were times when a black bird suddenly flew into our house, and I thought, as if it were a black cat crossing my path, “something bad is going to happen,” even though I’ve never heard such a superstition. It’s just something I know. When my friend Seth passed away, cardinals appeared to his mom. A cardinal was his favorite team’s mascot. For a few months, whenever I spoke of Seth, I’d always see a cardinal out of the corner of my eye. Every time I noticed them, I’d tell myself it was simply a coincidence. To spite me, more cardinals would show up. I’m paying more attention to birds now. 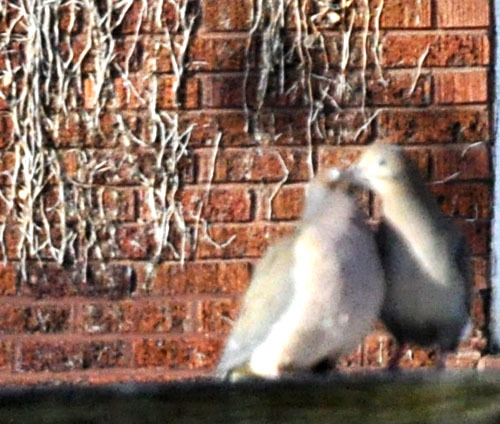 This morning, I looked up and saw two morning doves kissing on top of the kid’s swing set. Yes, I do realize this photo is blurry. I was simply too cold/lazy to go outside and shoot a proper photo and just shot this through the kitchen window. 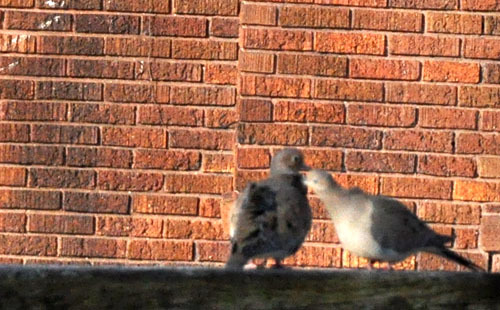 Besides, I didn’t want to disturb the love birds and their obvious love fest. I wonder what these birds are bringing me. Something good, I’m sure. I’m only going to notice nice things about birds now — and make myself my very own self-fulfilling prophecy. And if more dead bats happen to show up, I’ll just tell myself that these bats just happen to represent all the bad things in my past. I wonder if that will turn the bad spell off?